Talks have begun between the two at a senior level and working parties are studying the details of an agreement that could be clinched in the next six months. The groundbreaking accord would set a new quality level in the global food industry, which until now has been subject to varying standards according to regions and countries. Mohammed Al Gergawi, the chairman of the Dubai Islamic Economy Development Centre, the body formed to push Dubai’s aim to be “capital of the Islamic economy” in two years, revealed details of the planned deal on the sidelines of the World Islamic Economic Forum in Dubai. “It is all about certifying halal products in different parts of the world. If it’s approved in Malaysia, it should be approved in Dubai and vice versa,” he said. The global halal food industry will be worth an estimated US$2.26 trillion by 2018, according to the information group Thomson Reuters. The proposed deal with Malaysia is part of the “hub-to-hub” strategy of Dubai food authorities, whereby halal products can be delivered and received at approved and accredited zones. “The Islamic world has to create its own standards and Muslim populations in the rest of the world need somebody they can trust. This is as much about international standards as about the Muslim world,” Mr Al Gergawi said. He also revealed the Government of Dubai was in talks with one multinational food company to agree standards for halal produce sold outside the Muslim world. “They came to us because they recognised the need for quality halal standards,” he said, declining to name the company. The planned deal with Malaysia was accompanied by other signs of increasing cooperation between Dubai and Kuala Lumpur. At a ceremony at the forum, attended by Najib Razak, the Malaysian prime minister, memorandums of understanding were signed between bodies and companies representing the two, aimed at “bilateral cooperation” in financial services and other sectors of the economy. One of the project’s aims is to increase the level of cooperation between the securities commission of Malaysia and the UAE Federal regulator, the Securities and Commodities Authority, to “build capacity between the two leading regulators of Islamic capital markets”. “Dubai has the potential to be a hub of the Islamic economy and there are a number of exciting projects being planned. 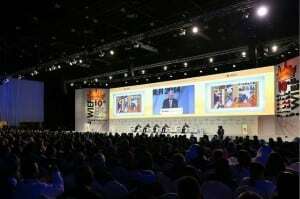 The opportunity for cooperation is tremendous,” Mr Najib said. He added that further collaboration in the financial sector was possible, in the form of dual listings on Kuala Lumpur and UAE markets. “The scope is wide and we would approach the matter of further financial co-operation in stages,” Mr Najib said. Dubai and Kuala Lumpur are among the top three leading centres competing for sukuk listings in the world. The third is London. The forum also heard news of the first online Islamic finance degree, a masters in business administration (MBA), in a venture between the Hamdan bin Mohammed Smart University in Dubai and the Universitat Oberta de Catalunya of Spain.